In between Holiday Parties I stopped by an open house at Essensuals London hair salon for a Label M. intensive conditioning mask. Needless to say, I was the perfect candidate to see if this treatment actually worked. A crossroads of fashion, music, art, design, and education Essensuals London is the ultimate salon experience. They are also the exclusive hairstylist of London Fashion Week. In fact, the salon’s global network of stylists play a virtual role in the fashion industry by styling runway shows and defining the latest trends in London and Paris. 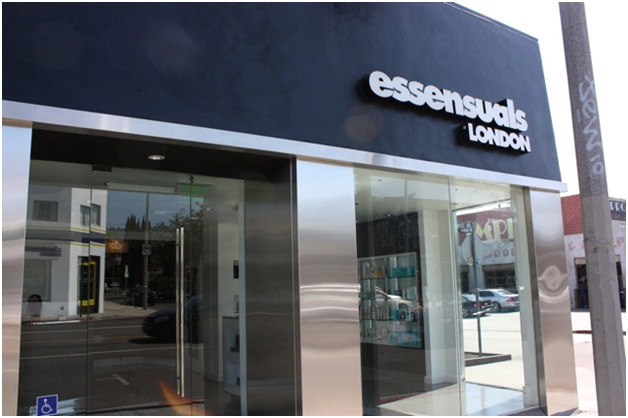 First established in the UK by the Mascolo family, Essensuals London on Melrose is the first US flagship location. It represents the next generation of salons by offering innovative styling, cut, color services, and indulgent hair treatments. The state of the art facility has a separate room upstairs for coloring and while your color is setting you can enjoy high-tea out on the rooftop patio. You can also receive free personalized advice from the “Beauty Bar” on products, tools, and styling techniques. I was fortunate to have my hair worked on my Laini Reeves, who is the owner of the Melrose Salon as well as the U.S. Creative Director. Laini has been in the business for many years. She is an international editorial and celebrity stylist with a very impressive résumé. Laini took pity on my bleached blonde hair and also treated me to a warming oil scalp treatment in addition to the intensive conditioning mask. While styling my hair she told me how Essensuals London represents the worlds of fashion, music, and art, which is why she chose the Melrose location because it’s in the heart of it all. The salon itself reflects her British heritage - even the bathrooms, which feature life-size murals of the Queen of England and Prince Charles. Fashion forward styles and impeccable customer service are at the heart of Essensuals London. Comparatively speaking, the prices are quite reasonable. Laini has brought together stylists and colorists from a variety of backgrounds to ensure that the salon’s staff is as diverse as its clientele. Her goal was to create an atmosphere that was relaxed and inviting. It’s safe to say that she succeeded because everyone that works there is very friendly and attentive and they take pride in their work. As for the hair conditioning treatment…my hair hasn’t been this soft since…well…before I started bleaching it. Upon leaving I was given a gift bag with samples of shampoo and conditioner. I also received a 10% off gift card for Madison (8115 Melrose Ave.) and 10% off at Foley + Corinna (8117 Melrose Ave). Essensuals London is a great salon. You can bet I’ll be back. Narrative by Nikki Neil, Photos by Nikki and courtesy of Kravitz PR.